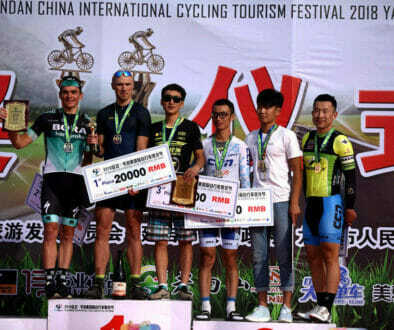 Young promising talent Lan Xiaoguang from Qingdao in Shandong province was the best long distance rider today in Vatternrundan China in Yanbian. 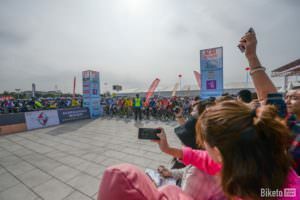 After joining a breakaway group with established contender Zhao Fengming and Russian Roman Ignatenko, he dropped his companions on Sunshine Mountain with the top 8 km before the finish and arrived solo in Tumen City. The weather forecast said sunny and very warm, but a rainshower in Yanji one hour before the start proved that nobody can book the weather. 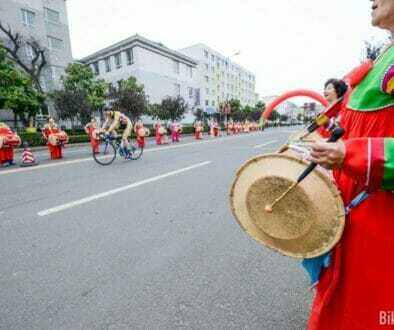 Luckily, when the 700 participants got going at 9:30 am , most of the roads had already dried up again to allow for a hassle-free ride through Yanbian country. This is the Korean Prefecture of Jilin province, bordering North Korea, and you can see the Korean cultural influence everywhere. 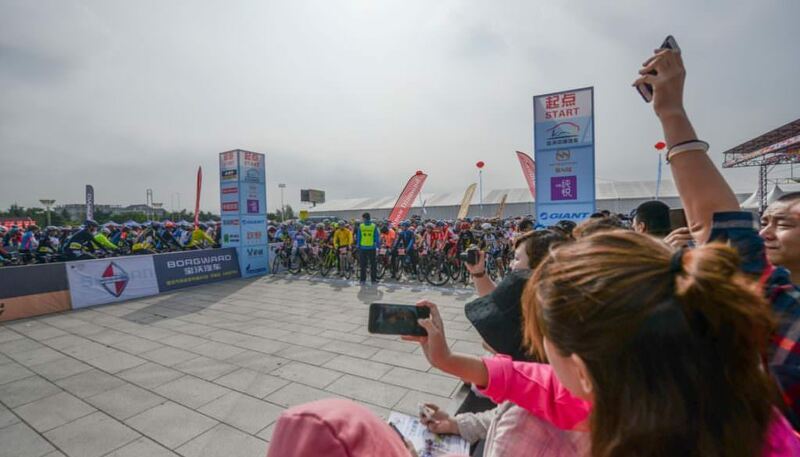 Today’s edition of Vatternrundan China, the sixth in history, featured a one-day 100km course from Yanji to Tumen, with a 41K short distance for road cyclists and mountainbikers for the less ambitious participants. 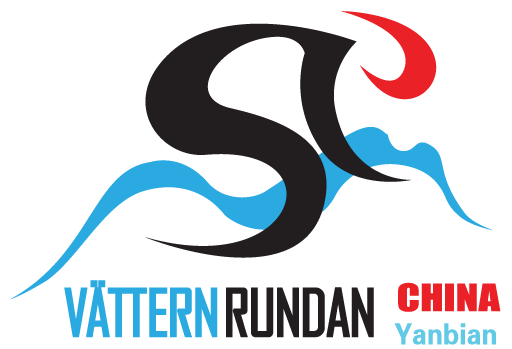 The event also enjoyed the attendance – and participation – of a delegation of Sweden’s famous Vatternrundan event, held every year in June in Motola around the big Vattern lake. After a few fruitless breakaway attempts, notably by Chinese rider Wang Ziyi -who would eventually finish sixth – it was the move by good old Zhao Fengming at km 23 that wrote the story of the 100K race. 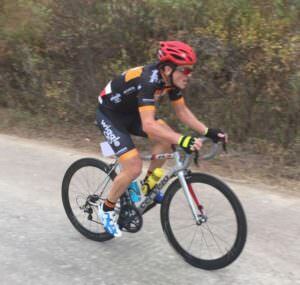 Hailing from Shenyang in neighbouring Liaoning province, the 48-year-old has a reputation for long breakaway attempts, something he also did in the first ever edition of Vatternrundan China back in 2012 on the way to Changbai Mountain. Today he was joined by Vladivostok rider Ignatenko and the strong youngster Lan Xiaoguang. Together they worked very well to open up a gap over the first group that contained last year’s champion Denis Okunev from Khabarovsk in Russia. It didn’t take long before they were out of sight and could start dreaming of victory. However, when halfway through the race, Zhao Fengming started to show some weakness on the uphill slopes along the border with North Korea, it looked like the chasers would still have a chance to come back. Alas they came too late. Denis Okunev gave it all he had on the big 3,5 km climb of Sunshine Mountain, but he came too late and would eventually cross the finish line in fourth place. The battle for the race win became a dual between Lan Xiaoguang and Roman Ignatenko. 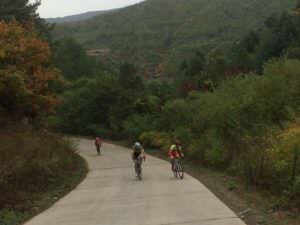 As soon as they commenced the steep first section of Sunshine Mountain – which offers a fantastic view over Tumen City and of North Korea – the Qingdao rider accelerated. The Russian did all he could to keep up with Lan Xiaoguang’s blistering pace, but after 1K into the climb he cracked. The Chinese rider was gone and after a successful descent he enjoyed the little 4K loop in Tumen City as a loop of honour. Ignatenko managed to stay ahead of Zhao Fengming to grab second place. The women’s race was hotly contested and saw a Chinese victory as well. Li Jujin won by just under three minutes over Russian riders Ekaterina Abrosimova and Kristina Vasileva. The unique border cycling event open registration	Lan Xiaguang conquers Vatternrundan China!